Kate is full time painter, whose commute to work is through her vegetable and flower garden. 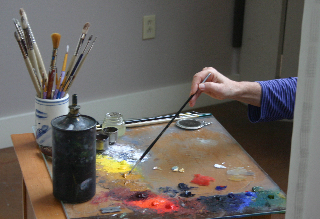 She maintains a studio in the middle of a college town in Vermont, where she has lived and painted since 1991. Her portraits and paintings hang in public and private collections across the United States and abroad. In 1998, Kate created the illustrations for Amanda Hesser’s The Cook and the Gardener. Her illustrations have appeared in Horticulture Magazine, Harrowsmith Country Life Magazine, and Vermont Magazine. Garden Designer Gordon Hayward used Kate’s work in his book Art and the Gardener. Kate received a Vermont Community Foundation Grant in 2000 to develop a set of Botanical Illustrations of some of the endangered species of Vermont, and she has been recognized by the Garden Writers Association of America with a Quill and Trowel Award of Excellence. Along with organic gardener Judy Stevens of Golden Russet Farm, Kate and Barbara launched the garden to kitchen column Patchwork: Three Gardens, Many Kitchens in The Addison Independent, a bi-weekly newspaper, in 2010.